van Gulik illustrated his own books. 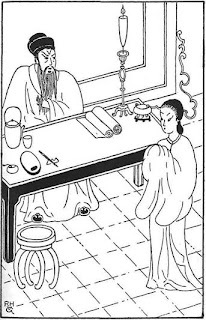 I was going to write a big article on the historical figure Di Ren Jie. He was a magistrate during Tang Dynasty (7th Century via Western calender) China. But I keep coming across articles and blogs that have already covered the territory I was going to cover. So I have a brief review of two books and then for the more curious, a few links at the bottom of the page to the most enlightening articles. Just briefly: Di Ren Jie was a judge who it turns out like most judges of the time, were more like Judge Dread than Judge Judy. They were out in the field doing detective work and police procedurals with investigating, interrogating, torturing and convicting criminals. The only thing they didn't do by hand was the physical act of torturing or capital punishment.There is apparently a long history in China of these judges being written about in fictionalized accounts. Sort of like epic pulp fiction, as the cast of characters ranged into the hundreds along with an even higher number of chapters, with each chapter being hundreds of pages. These books were huge and full of intricate information. This is something that went by the Western world without anyone ever noticing. But then, enter Robert Hans van Gulik. He was a mid-20th Century Dutch diplomat whose work brought him to Japan and China where he became an expert on Chinese history. He stumbled across an anonymously written 1800s pulp story about one of these judges from the 600s. Because of the brevity of this story, being shorter than thousands of pages with much less than hundreds of characters (so being more close to what the modern world would consider a book), he felt it would be great material to translate for a modern audience. There are three cases in this book. The first might be called The Double Murder at Dawn. The case describes the hazardous life of the traveling silk merchant and the murder which is committed to gain wealth. The second is The Strange Corpse which takes place in a small village, a crime of passion which proves hard to solve. The criminal is a very determined woman. 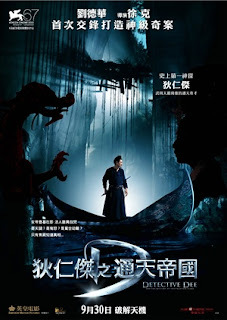 The third case The Poisoned Bride contains the murder of the daughter of a local scholar who marries the son of the former administrator of the district. This case contains a surprising twist in its solution. All three cases are solved by Judge Dee, the district magistrate - Detective, prosecutor, judge, and jury all wrapped up into one person. First edition of Celebrated Cases. I found this book to be really grippingly intriguing all the way through. The way the plot elements intertwine and van Gulik's knack for writing very clear prose is highly enjoyable and very easy to digest. The penchant for torture being pretty much the answer for everything was a bit unnerving. But then that was the way of things at that time and van Gulik did not whitewash the original prose. A very in-depth and fascinating introduction puts the torture, the way of life of Magistrates and how the Chinese legal system itself worked into historical perspective. All in all, if you want to maximize your experience with Judge Dee on a historical and fictional level, this first book is definitely the one to read. van Gulik went on to write 17 original novels and collections about Judge Dee. 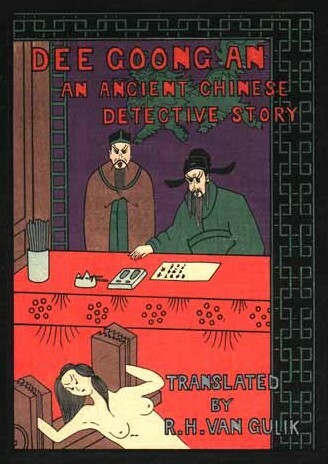 Since CELEBRATED CASES was a direct translation of another author's work I wanted to try one of van Gulik's original titles and jumped on JUDGE DEE AND THE HAUNTED MONASTERY (1961). This is from about mid-way through van Gulik's Judge Dee series. It seems to have its basis in the "Old Dark House" mysteries of the 1920s-50s, where a group of people typically become trapped in a single maze-like location and as bodies pile up, the hero has to figure out whodunnit. This book definitely has that feel. Judge Dee and his three wives are on their way back from a visit to family in the capital accompanied by the Judge's aid Tao Gan when a terrible storm forces the party to take shelter for the night in an isolated Taoist monastery of sinister repute. The wives go directly to bed but the Judge is required to pay a courtesy visit to the Abbot. Thus begins an endless night of murder, mayhem and madness as the Judge, suffering from the beginnings of a head cold, solves the mysterious deaths, punishes the guilty and brings two star-crossed young couples together. This book, a completely original tale, has no torture to speak of and Judge Dee comes off more as an everyman detective as you might find in contemporary (1950s) fiction than as the high and mighty Magistrate portrayed in CELEBRATED CASES. Though there is no problem with the first book and it is completely enjoyable, this shift in focus on Dee's personality makes it less troublesome to get through. Judge Dee is fairly likable in this. I just have to admit that anyone who uses torture is probably not going to seem that amiable or likable, so the character has a one-up in HAUNTED MONASTERY. Though these two books are different animals, they are both eminently readable. I will absolutely continue reading further Judge Dee adventures. Next will be THE CHINESE MAZE MURDERS. I have to admit I'd never heard of Judge Dee until a movie about him came out last year. DETECTIVE DEE AND THE MYSTERY OF THE PHANTOM FLAME is an original story by Lin Quinyu and filmed by the legendary director Tsui Hark (Chinese Ghost Story-1987, Once Upon a Time in China -1991). This big budget epic intrigued me about the character and the more I researched the more I realized how much Judge Dee there was out there to read and learn about! The movie DETECTIVE DEE AND THE MYSTERY OF THE PHANTOM FLAME is out in various DVD formats but I believe the valid Region 1 DVD comes out in December (2011). It is also currently touring the US at art house theaters. Roger Ebert's review is here. There is also a movie from 1974 that is an adaptation of THE HAUNTED MONASTERY, called JUDGE DEE AND THE MONASTERY MURDERS which you can find a review here. There is a chronology of the stories along with lots of background data here. And there is an excellent and in-depth essay on van Gulik and Judge Dee here. If all of this fires your sparkplugs and you can't get enough, then be advised that a Chinese TV series on Judge Dee will be available on DVD with English subtitles starting in November. Another nice overview of the character is at this blog. And here I thought this was going to be a brief article.